Fill a large bowl of water the juice of one lemon. 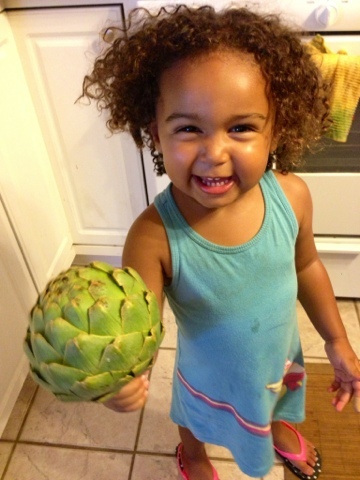 Trim 1.5 pounds of artichokes until you reach the pale leaves at its center. 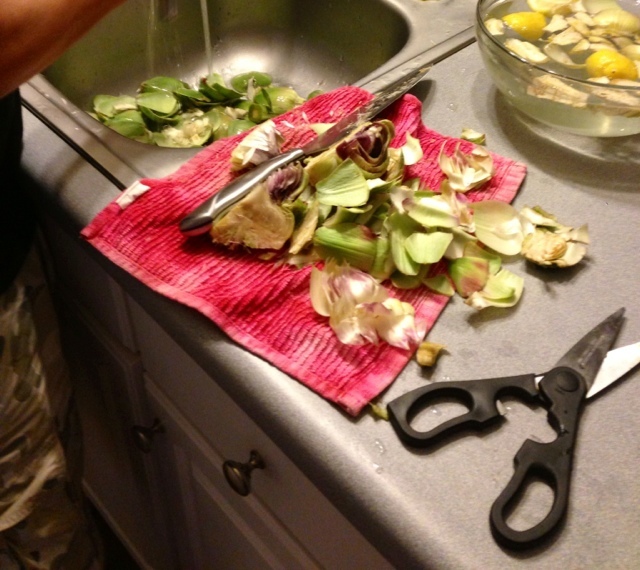 Then, chop off the tip of the stem, about one-third of the way from the top. 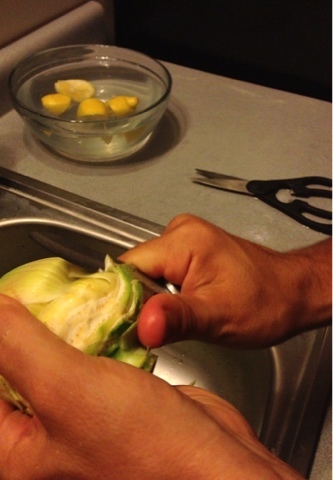 Now, at the bottom of the stem, shave off the rough skin until you reach the soft, pale meat of the core. The hard part is over now. Your kitchen should look something like this. This recipe calls for one cut, whole chicken. Season it well with salt and pepper. Then, warm 2 tbsps of olive oil over medium-high heat in a large saucepan. Place the chicken in to the pan and brown, about three minutes on each side, then pull them out of the pan and set them aside. 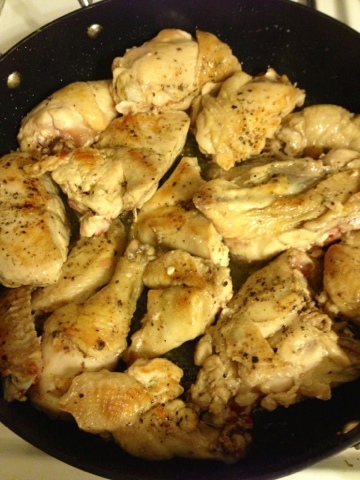 Drop five cloves of crushed garlic in to the chicken fat left in the pan. 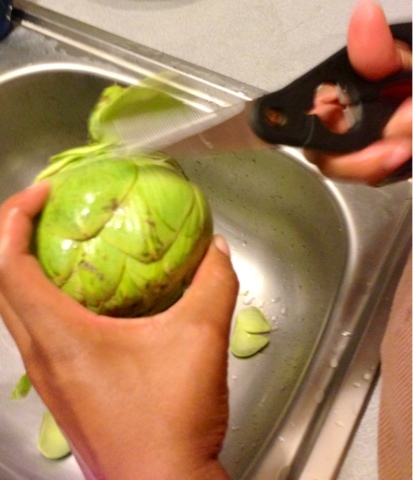 After a minute, drop in the drained artichoke. 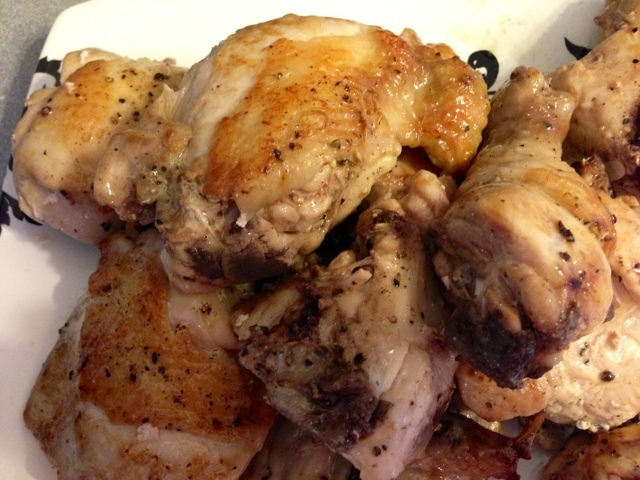 Season with salt and pepper, to taste, and continue to deglaze the pan with them for three to four minutes. Then, pour in one cup of white or rose wine and raise the heat to high. 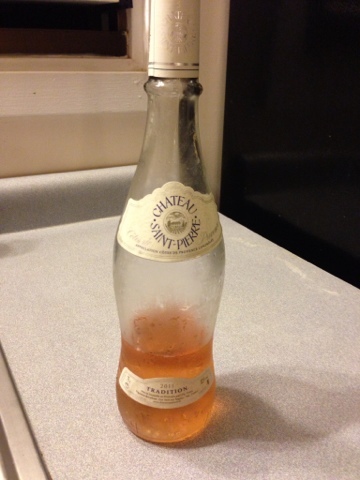 We had this fantastic 2011 Chateau Saint-Pierre on hand. Stir everything until it is almost evaporated. 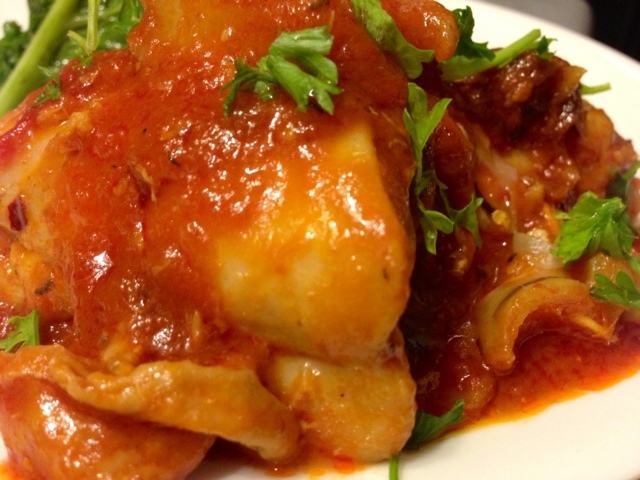 Pour in 1/2 cup of crushed, San Marzano tomatoes and 1/2 cup of a premium tomato sauce. Deglaze again, scraping up all of the lovely browned bits from the bottom of the pan, then cover the pot and let the sauce simmer for 10 minutes. Time to bring the chicken back in to the mix. Place it back in to the pan, covering it with the sauce. Let this simmer for an additional 30 minutes, the latter fifteen with the sauce uncovered so that it can reduce. Taste and adjust seasoning, then serve right away, sprinkled with a bit of chopped parsley. Dice one medium eggplant in one inch chunks. Put them in to a strainer and toss them with one teaspoon of salt and let them drain for 30 minutes. Meanwhile, pat one, cut whole chicken dry and season with salt and pepper, to taste. 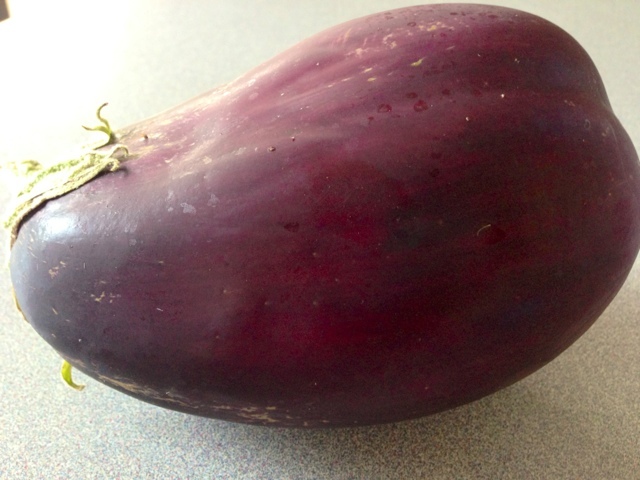 When your eggplant is ready, pour one cup of vegetable oil in to a large skillet, over medium-high heat. 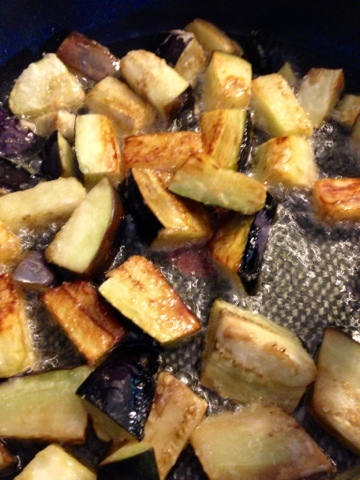 As it warms, dust your eggplant with flour on all sides, readying them for a fry. Gingerly drop them in to the skillet, making sure that they are evenly spread out over one layer in the pan. Toss, until they are browned on all sides, then remove them from the pan and let them drain on paper towels. Now, drop the chicken in to the skillet. You are looking for a pale brown tinge of color here, on all sides. This should take about 5 minutes. When this is achieved, pluck these out of the pan and let them rest on paper towels as well. You will now use all of the goodness left behind in the pan for your sauce. 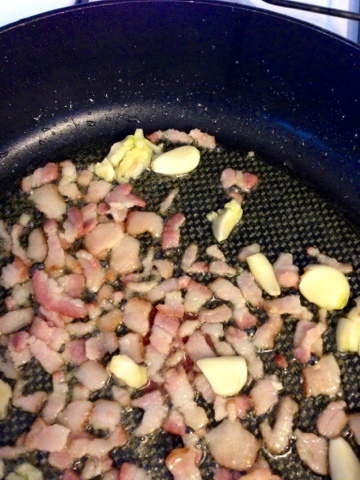 Stir 1/2 cup of finely chopped bacon in to the pan. Let the fat render out and then drop in six crushed garlic cloves and 1/2 tsp red pepper flakes. Let everything brown for a minute, then pour in one cup of white wine. Raise the heat to reduce the wine. Then, pour in a 16 oz can of crushed tomatoes. Season with salt and pepper, to taste. Bring it all to a simmer for 15 minutes. Then, fold in the eggplant, being careful not to mush them in to the sauce. Cook another 5 minutes. Adjust the seasoning, if needed. Sprinkle chopped parsley over the chicken. The internet is down here and I am writing this entry from my iPhone, so bear with me on it's brevity. Just wanted to give you all a little peek in to our long weekend before it got too late for you to care. This Friday was Statehood Day in Hawaii. Kind of like Flag Day, one of those non-celebrated municipal celebrations. Banks were closed. Schools were closed. It seemed like the perfect day for a pool party. So, we invited some of our friends and Jada's friends and Asia's friends over and it turned in to an impromptu going away bash for Asia's trip back to New York this week. There was dancing and dining and swimming late in to the night. Saying good-bye to Asia until we see her again in October is hard and sad, but it felt great to share our love for her with our new friends here. After the festivities, we quickly cleaned up and headed straight back in to the kitchen. Slow Food Maui was holding a Saturday afternoon contest at the University of Hawaii's culinary school in Kahului, with the Maui Coffee Association. We wanted in and we intended to win, notwithstanding our late start. We finished and plated the dish at the venue early the next morning. Then, we went to lunch to wait for the results. A few hours later, we returned to hear the winners announced and were pleased to hear "La Famiglia Di Bari" called out as third place winners! Not bad, considering our Friday night frazzled frenzy to pull this off with two kids in tow. But watch out, Maui. We'll be back next year! August 15th is Ferragosto in Italy, a holiday only trumped by Christmas and celebrated by everyone in the country. It goes way back, to the reign of the Roman Empire and before the times of Christ, initiated by the emperor Augustus to celebrate the the hard work of the harvest. Each region, each town celebrated the day in its own unique way, with enormous amounts of food being the one thing every festivity had in common. Today, Ferragosto is more like a migration, with most Italians heading to the mountains or the beach to escape August's oppressive heat. We're usually there, in bumper to bumper traffic on the Autostrada, doing the eight hour drive from Piacenza to Lacedonia. It's worth it. Two weeks of eating and drinking and dancing and singing and connecting undistracted with friends and family is priceless. Sadly, we did not live up to the extravagance of the holiday this year. No trip to Italy. The idea of vacationing is laughable. Nor did we prepare an elaborate meal here at home, instead opting for very simple pan seared salmon, white rice and salad after the thrill of watching Asia ride her first wave during a surfing lesson. Our focus is on setting down roots in Maui and, truth be told, every day could be Ferragosto here. Every day is Christmas, every day is like the Fourth of July because we are so happy. Yes, it's difficult, sometimes unbearable, without our family and friends but we are breaking new ground, defining new territory. There will be different ways of celebrating or sometimes, like today, we won't celebrate at all. We are redefining traditions in our own unique way. Kale inspires me. The beautiful bundles that we receive every week are an invitation to experiment. 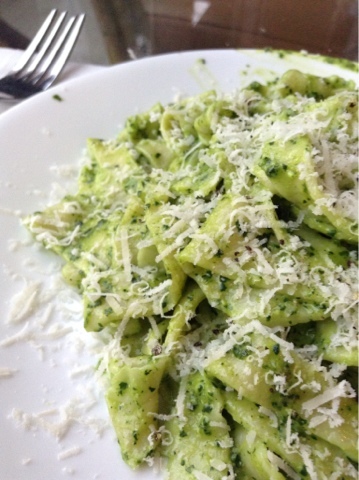 This week, kale pesto came to mind. The vehicle for this bright sauce? Fresh fettucine. 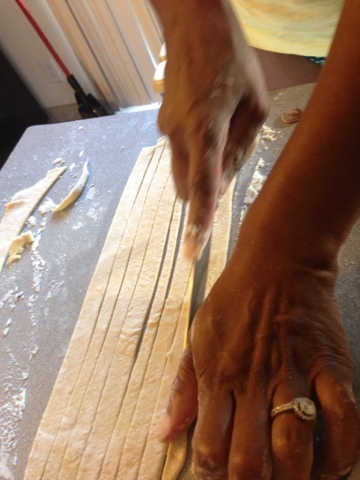 There was a time, before Va Beh', when I made pasta from scratch at least once a week. As we prepare to create a menu, including only fresh pasta, for our new restaurant, this recipe reignited our passion and appreciation for the inimitable taste and texture of pasta made by your own hand. 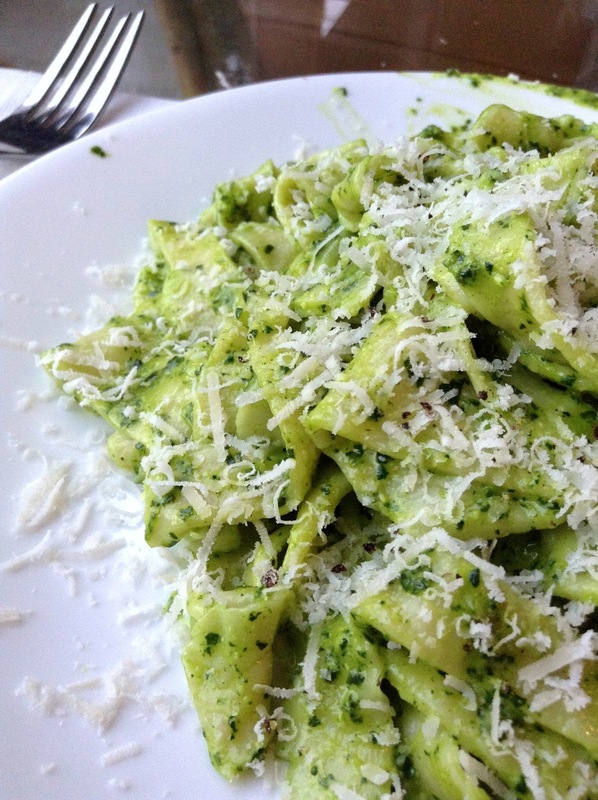 The pesto is the easy part, so we'll start there. 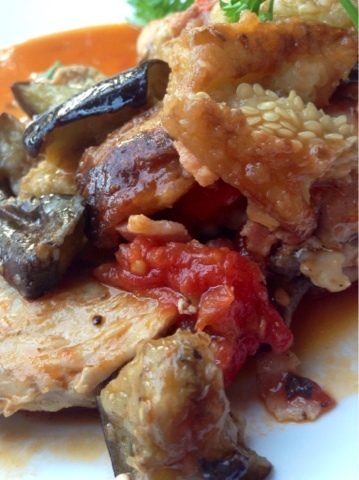 This recipe is an adaption featured by Dr. Weil in his latest cookbook, "True Food". We've tweaked it a bit, but basically, you just boil 2 bunches of chopped kale for three minutes, then immediately drop the kale in to a bowl of ice water, to maintain the bright color. Drain completely. Then, dump the kale, 1 cup of grated parmesan cheese, 3/4 cup olive oil, 1/2 cup pine nuts, 2 garlic cloves, 2 tsps of salt and 1/2 tsp of red pepper flakes in to a food processor or blender until smooth. While that marinates in the fridge, you can work on your fettucine. This part of the meal requires a little more brain and brawn. 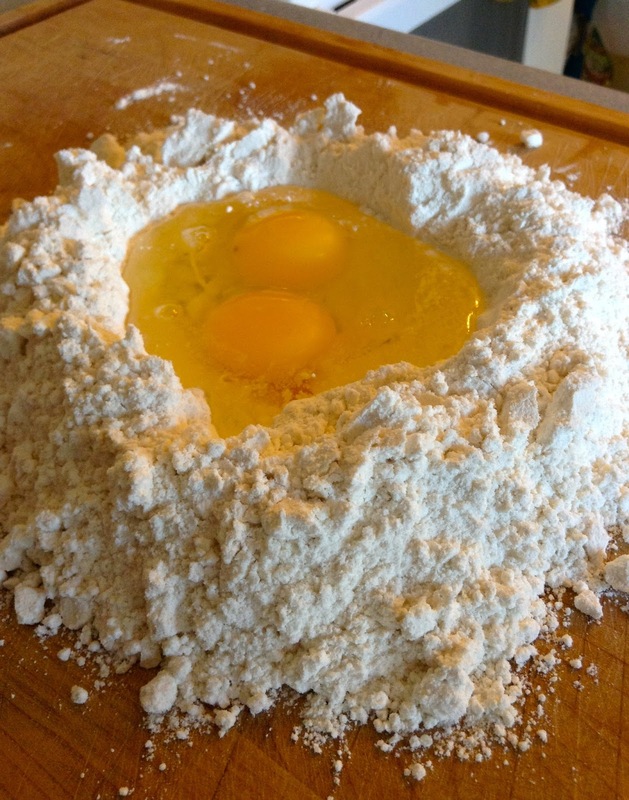 For every cup of pasta you would like to make, you will need one cup of flour and one egg. 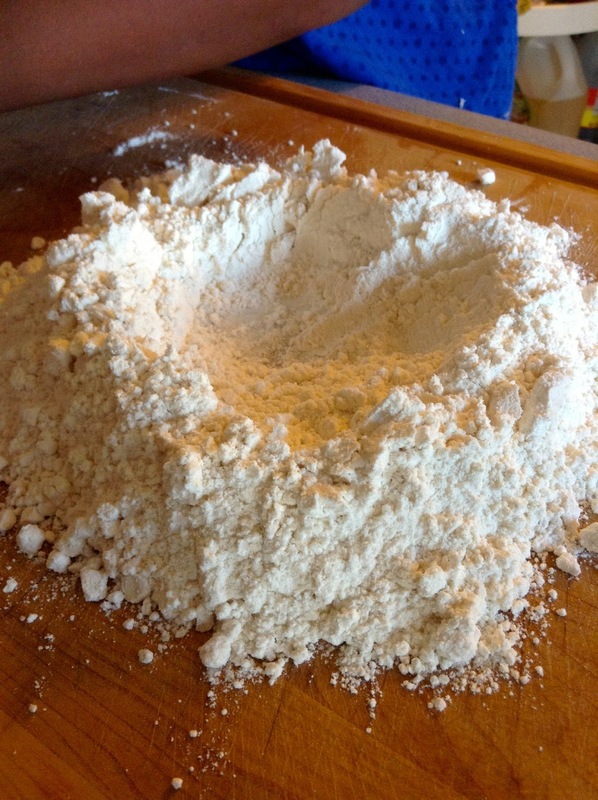 Make a well in the middle of your flour. Break an egg in to the well. 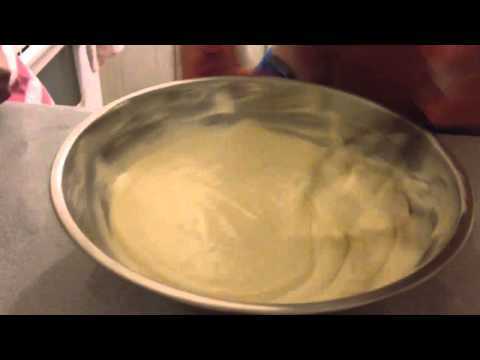 Whisk, until the egg is fully incorporated in to the flour. 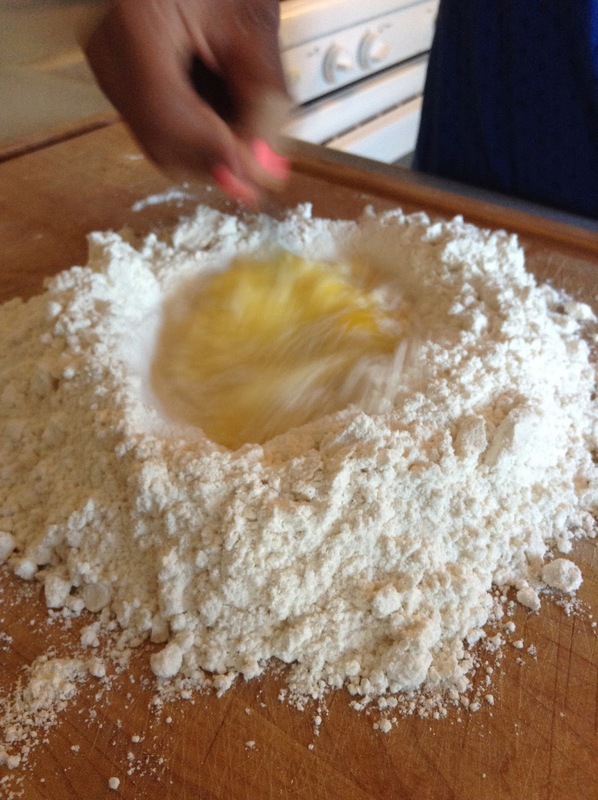 Knead the dough, once it thickens to the point that you cannot whisk any longer. 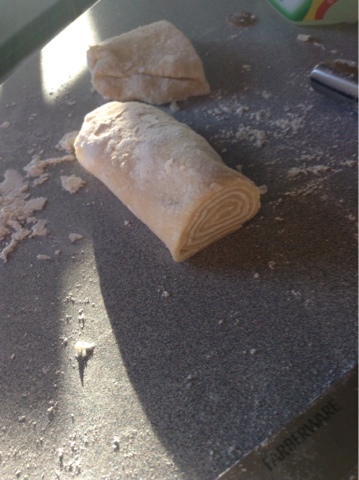 Then, roll out it out into thin sheets. 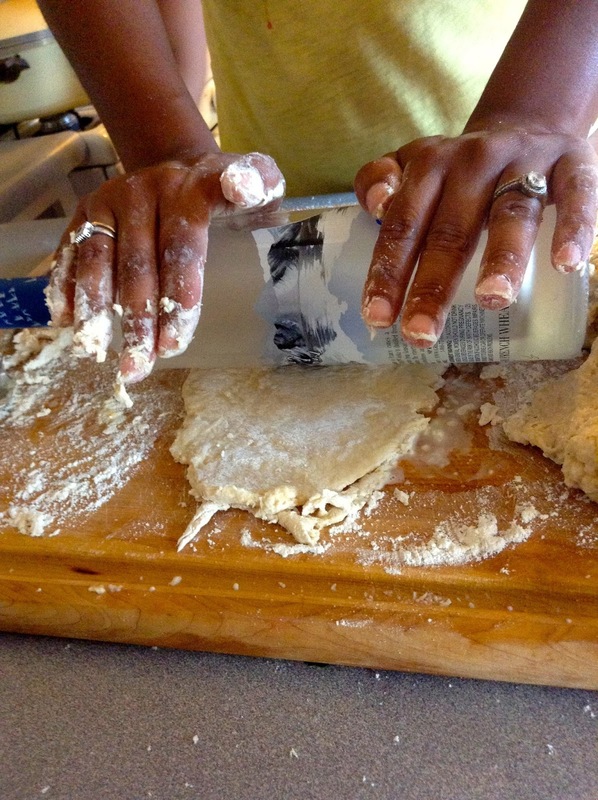 I'd suggest a conventional dough roller at this point, but we didn't have one on hand so we used a heavy bottle of top shelf vodka instead. It did the trick. Stop, once your sheet is rolled as thin as possible. Then, begin to cut your pasta. You can do this free hand. 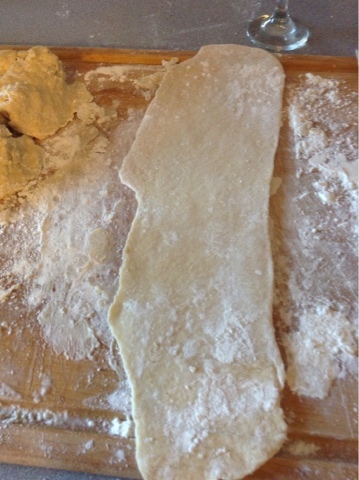 Or, you can roll your sheet of dough and slice through uniformly for a faster option. 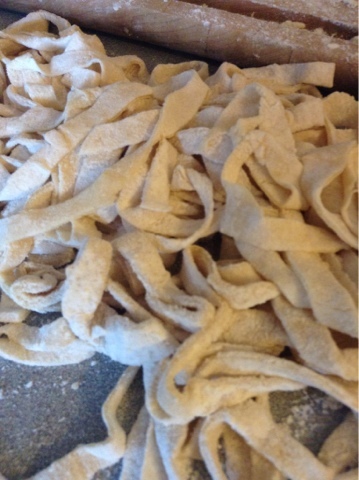 Sprinkle each new batch of noodles, as you go, with a little flour to keep them from sticking to each other. Don't over-think or try to make this a perfect process. According to Michele, inconsistencies are appreciated by Italian eaters and remind you of the loving hand of the pasta's maker. 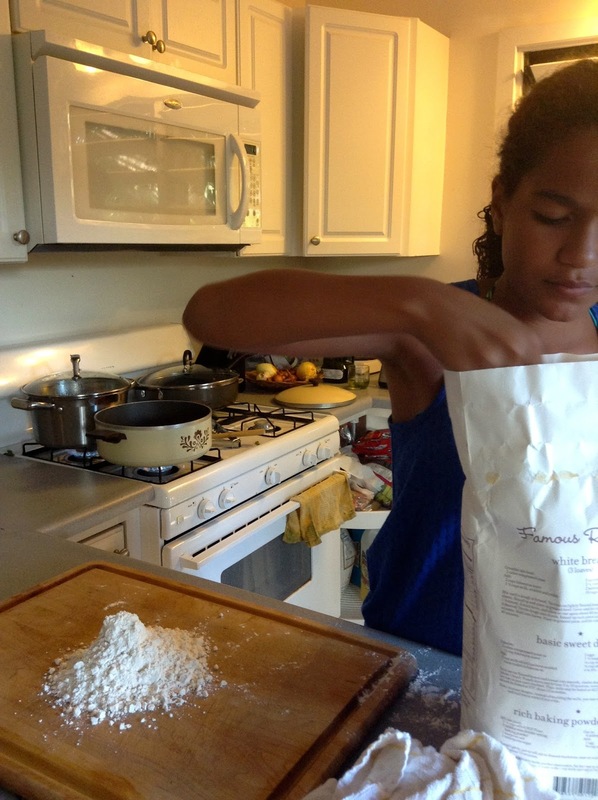 Once you let go of the idea of perfection, making pasta is so easy even a two year old can do it. Your final product should look something like this. 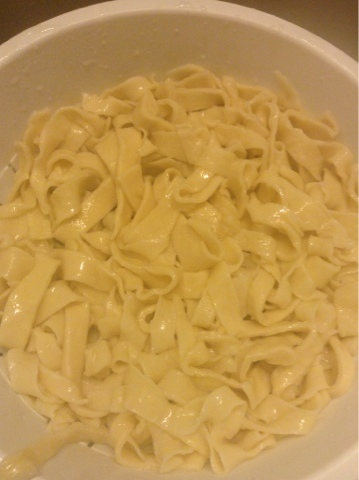 Now, drop your fettuccine in to boiling water as quickly as possible. 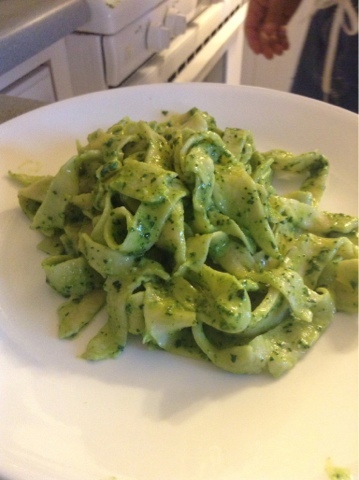 Have your pesto and a strainer close at hand because fresh pasta cooks much faster than the store bough variety. Three minutes should be enough time for a perfectly al dente noodle. integrate the sauce and noodle. 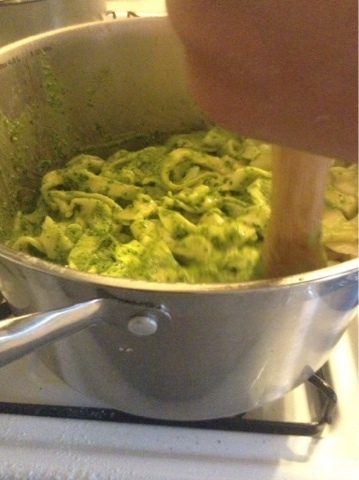 Then, drop your pasta back in to the hot pot and stir in the pesto, gingerly tossing the two together as you would a salad, until the pasta is completely coated with the pesto. Pour in a few drizzles of your reserved water if the pasta seems dry or tacky. The consistency should be smooth and glossy. And finish with grated Parmesan cheese, fresh pepper and peperoncino. 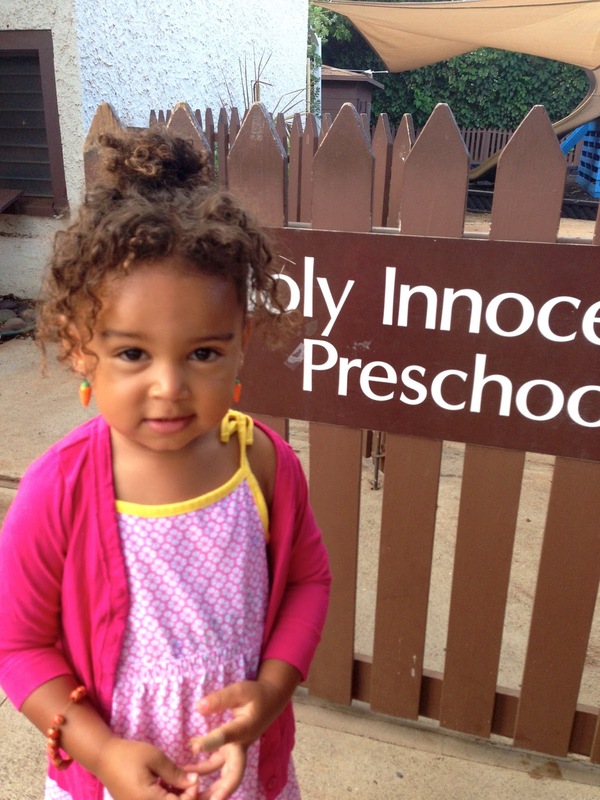 Jada started pre-school on Monday. We have been preparing her for months, trying to beat any potential tantrums or tears off in advance of the big day by visiting the school, referencing it in day-to-day conversation, discussing the details of each day and introducing the idea of separation as delicately as possible. "In the morning, Mommy and Daddy are going to drop you off at school and then we will pick you up later, ok?" Jada furrowed her brow and looked at me earnestly, " Can you come?" "Moms and dads are not allowed to stay. School fun is only for teachers and kids." She thought about this for a minute, "But can you stay and help the teacher, Mommy?" These were the sweet, but resistant questions that Jada asked as we got closer and closer to the first day of school. So, my expectations weren't high. I was praying for a peaceful drop-off but I was bracing myself for drama. How to soften the blow? The instruction manual that we'd received from the school suggested a brief and curt good-bye. They also prohibited toys or stuffed animals or any other cuddlies that I would normally snuggle in to Jada's arms to console her. That morning, I gave her a little beaded bracelet from my jewelry box and reassured her that Mommy would never be far away. 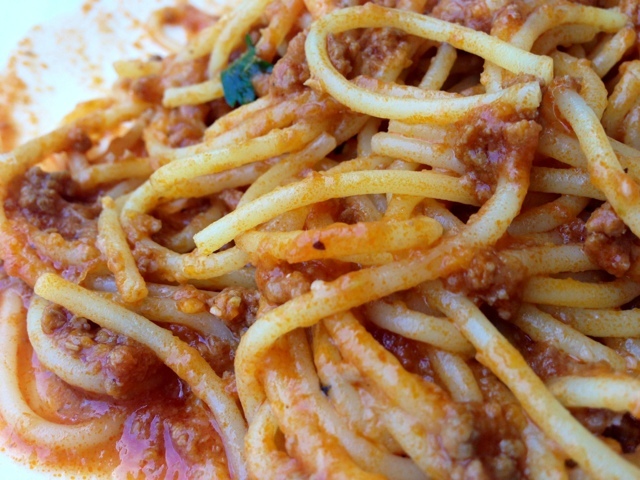 The bracelet, and a bowl of pasta bolognese for her first lunch at school, were the only comforts that I could provide for her day without us. Dice 4 garlic cloves, 1 carrot, 1medium onion and 1 celery stalk. Sautee them in a deep skillet or pot with 2 tbsp of olive oil over medium-high heat, until the onions are translucent. This should not take more than five minutes. Add 1 lb of ground beef, stirring and cooking it until uniformly browned. Deglaze the pot with 1/2 cup of white wine, stirring up all of the little bits of caramelized goodness sticking to it. 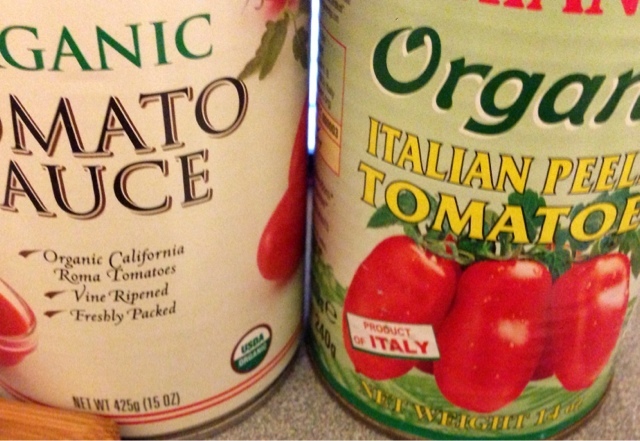 Then, add a 28 oz can of peeled, San Marzano tomatoes. Stir and add a pinch of sugar. Simmer the sauce for two hours, slightly covered, over a low flame. The beauty of this recipe is that you can make it on a slow Sunday afternoon, refrigerate it and use it for quick lunches or dinners during the week. But, back to Jada's first day. It went off without a hitch. She was all smiles as she waved good-bye. I was the one who ended up falling apart, walking out in tears, because I was so proud of her. Here, in Maui, we are preparing for the beginning of the school year. Jada starts full-time pre-school tomorrow and our lazy summer days are essentially over. It's been a good one. With Jada in school most of the day, we will be focusing on and gearing up for the opening of our restaurant as well. Back on the horse is not a bad place to be after months of only surf and sand on the schedule. 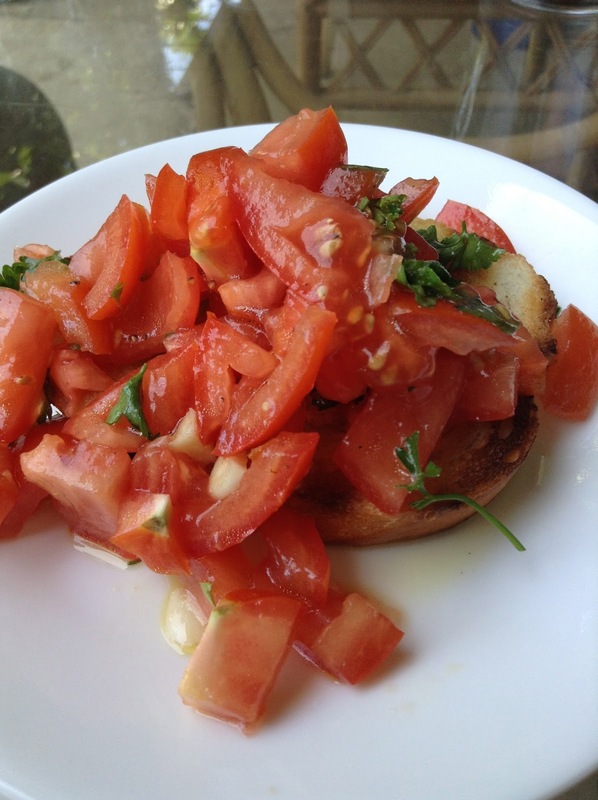 So, here's to summer's last lazy day, a heat-free and fast bruschetta recipe using seasonal tomatoes at their peak. Chop 2 large, ripe tomatoes in to a medium bowl. Add 4 tbsps of extra-virgin olive oil, 2 minced garlic cloves, 8 finely chopped basil leaves and salt and pepper, to taste. Combine and integrate all of the ingredients. Refrigerate for at least fifteen minutes, while you are toasting 4 thick slices of French or Italian bread. Once the bread is toasted, scrape a clove of garlic on the surface of each slice and drizzle with olive oil. Then, top with the tomato mixture.